Police believe a man who caused a fatal motorcycle accident in Bellevue on October 4th was under the influence of marijuana when he made an illegal left turn in front of the motorcyclist who later died from his injuries. According to multiple news reports, police investigation showed that the driver of the vehicle, who has been identified as 33-year-old Caleb J. Floyd, was high on marijuana at the time of the crash. As a result, police believe his impairment was a direct contributing factor to the death of the motorcyclist, and Floyd is now being charged with vehicular homicide as a result. Floyd was arrested at the scene of the crime on October 4, 2013 after failing field sobriety tests and other tests given by a drug recognition expert. Surprisingly, he was released two days after being detained, but officials say that was because of how complicated prosecuting DUI cases can be when only marijuana is involved. On Thursday, December 19, prosecutors on the case filed for a vehicular homicide charge and issued a warrant for $100,000 on Floyd. According to police reports from the scene of the crime back in October, Floyd was driving east on Northeast 10th Street in Bellevue, WA in the early evening and was attempting to make a left hand turn onto 102nd Avenue Northeast at approximately the same time as Gaston who was riding his motorcycle west at the intersection. The left turn lane must yield to oncoming traffic at all times, which Floyd failed to do in this particular case. Floyd failed to yield causing a collision between his car and Gaston’s motorcycle, and it sounds like his impairment likely contributed to his poor decision making behind the wheel. Seconds before the crash occurred, Gaston brought his motorcycle down to the pavement causing a sliding motion of his bike into Floyd’s vehicle. A witness at the scene stated Gaston bounced backwards before landing on the pavement. Unfortunately, Gaston died due to serious injuries and was announced dead after being transported to Overlake Hospital. Witnesses also stated at the scene that after the collision, Floyd seemed very out of it and told officers he was on route to get food and had smoked marijuana two hours prior to the collision. When his blood was checked three hours after the collision, he tested positive for marijuana and twice the legal limit for driving according to Washington state law. 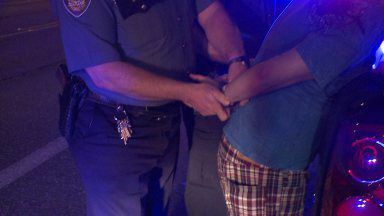 According to Lynnwood police officer Mark Brinkman, who is a certified drug recognition expert, this is the first vehicular homicide case that he is aware of involving only marijuana and no additional impairing substances, such as alcohol or other hard drugs since marijuana was legalized in 2012.